Triangle Street Eats is developing a new series that profiles owners of food trucks. 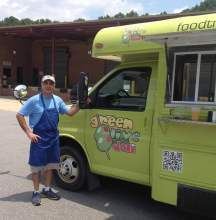 The first of these series profiles Hugh Mokry of Green Olive Deli, a newcomer to the Triangle food truck scene. We caught up with him at Sub Noir Brewing one afternoon, while reviewing his fare for our blog. You can find his review here. If you are a food truck operator, and you would like for us to tell your story, please contact us at Triangle Street Eats. We would love to hear from you. My story is short and sweet. I have always liked cooking and feeding people. I think when you share food with someone; you are able to connect to them, being if it’s only for a few minutes of contact, especially if your food satisfies their hunger. I was in the automotive business for 35+ years. After selling my business, I decided to turn my hobby and passion into a small business. I also enjoy helping the local anti hunger efforts, from volunteering at food shelters, to buying pre-packaged groceries, to making food and monetary donations to Raleigh or Durham rescue. I also try to remind people that the problem of hunger exists, and what they can do to help.